Maybe The Walking Dead has it all wrong – some zombies save lives. While promoting Times Scare, a year-round haunted house attraction near New York’s famed Times Square, a man in full zombie makeup spotted a black-and-white stray cat wandering in the street. Fearing the feline would get killed in the crush of traffic, Jeremy Zelkowitz, a “zombie” actor, broke character and scooped-up the feline. “I dress as a zombie every day and I just love animals — I try to do the right thing,” Zelkowitz told the NY Daily News. The actor took the cat to BluePearl Veterinary Partners — a nearby animal hospital. 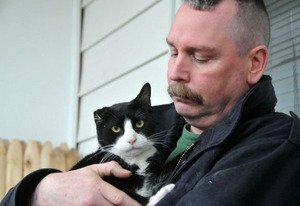 A microchip scan revealed the cat’s name (Disaster), but more important, the feline’s owner — NYPD officer James Helliesen. Helliesen lost the cat two years ago, when his wife left a window open and the animal clawed through the screen. Disaster was found 15 miles from his Long Island home. Helliesen met Disaster six months before the cat disappeared. The feline would gather with other strays near his police station. After Disaster was taken to a shelter, Helliesen adopted the cat — taking the animal off death row.